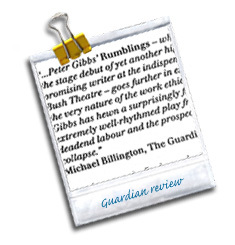 ‘Gibbs has hewn a surprisingly funny and extremely well-rhythmed play from dead-end labour and the prospect of collapse.’ Michael Billington, GUARDIAN. ‘A cruel comedy that accelerates to a ferocious farce.’ Irving Wardle, THE TIMES. ‘A mordantly inventive first play.’ Christopher Hudson, EVENING STANDARD. Cast: Dinsdale Landen, David Threlfall, Caroline Bliss, Ann Beach. 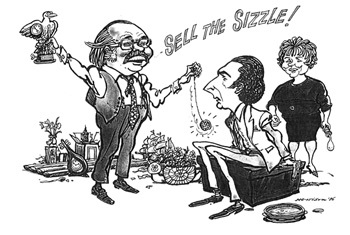 ‘A multi-faceted and cruelly expounded dissertation on the craft of selling. A light-hearted couple of hours with a sharp subterranean nip.’ Robin Ray, PUNCH. ‘The play supplies material for two glorious high-farce performances.’ Irving Wardle, THE TIMES. ‘A potent comic voice that searches out a note of human desperation.’ Robert Gore Langton, PLAYS and PLAYERS. ‘It is difficult to get an audience to laugh out of sympathy with a salesman and not at him. 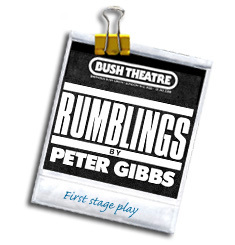 Peter Gibbs manages this with memorable sincerity and some very funny lines.’ Rosalie Horner, DAILY EXPRESS.